Rigid boxes with lids are made out of thick chipboard stock and the thickness of these boxes are usually 60 point which is about 0.060″ thickness. Thick chipboard is made out of raw recycled material and is safe for environment. Usually printing on this stock is not done directly instead white paper is printed using offset printing method and then pasted on top of the chipboard material to make it look nice. Lamination or UV coating is also done on the paper stock to make the surface either shiny high gloss or soft touch matte finish. Below are the Processes you must know before ordering these Custom Telescoping Boxes. How to Make Design Ready for Rigid Boxes? Designing for these two piece Rigid boxes with lids should be done separately panel by panel and not all of the panel together in one layer like folding boxes. These boxes are made differently than folding boxes. First design the top panel of the top lid, then all 4 side panels of the top lid. Then design the bottom panel of the bottom lid and then all for side panels of the bottom lid. You may save separate files for all these designs or you can make one file with separate layer for each side. How to Make Die-lines for Rigid Boxes? Die line for rigid boxes are quite tricky as these boxes are not cut using die as a one piece and then folded and pasted. The sides of these boxes are cut individually and then pasted together. There are no folding rules on the die for these boxes as this thick material cannot be scored with scoring rules. Each panel die should be made separately as per the design specification and then supplied to the printer or factory. Printer will cut the chipboard panels separately and then will paste these part together to make it in form of box. Rigid boxes don’t ship flat and are shipped as pre-assembled. 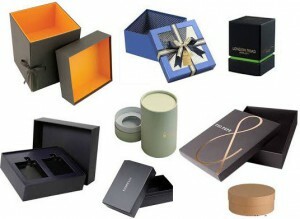 These boxes takes a lot of space and the shipping cost for these boxes is usually very high compared to folding boxes. These boxes should be packaged very carefully as the edges of these boxes can damage very easily during shipping transit if not packaged securely. Bubble padding should be used on these boxes for packaging. Usually shipping cost for these boxes is calculated in volume weight matrix. These telescoping shipping boxes takes up-to 100 cartons of 35lb volume weight for only 1000 boxes. So before ordering these boxes, keep in mind the shipping cost is going to be very high if shipped using regular shipping companies like UPS or FedEx.